The Polymath Chronicles: Winners announced and YET ANOTHER GIVEAWAY! Winners announced and YET ANOTHER GIVEAWAY! Thanks to all who entered to win Laura Caldwell's darling summer read, The Dog Park. Congrats to Trish Ryan, Erica, and KW! You have won signed copies. Email me your shipping address at staceyballisinfo(at)gmail(dot)com and Laura will get them out to you. For everyone who didn't win, you can pick up your copy HERE. And since it is my summer of prizes, I have another guest post from a pal with another giveaway! Gina B is one of my besties who has accidentally invented a couple of fabulous new skincare products! I'll let Gina tell her own story but I can vouch for the quality, I've been lucky enough to be one of her testers and I just love them. They do exactly what they are supposed to do, and they smell delicious. Gina is providing TWO sets of her body products to a lucky reader, just comment below with the skin or hair problem you wish you could fix forever! I'm excited to announced that I’ve released a line of body products - if two products can be called a line. 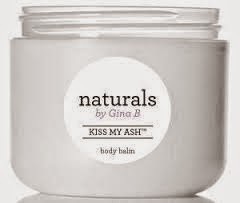 The company name is Naturals by Gina B, and the line is aptly titled Kiss My Ash. The name is very appropriate because it kisses away the ashy appearance of dry skin. There’s a tale of how this came to be (because of COURSE there is). Long story short, I was unhappy with my hair. (If you knew me personally you would know that I’m ALWAYS unhappy with my hair, but I was especially distraught about it this time). I was displeased because my naturally curly/wavy hair had been heat damaged from a terrible run-in with a smoking hot flat iron, and I was left with areas that are bone straight and others that have remained curly, somehow. Not really high on the cuteness scale, and very distressing. I loathed of the products on the market (and I have an entire closet full of them to prove it) and I willfully decided that I was going to make my own super-product that I would formulate specifically to address my issues and get my curls back. Chemistry was one of my favorite subjects in high school, so I got busy blending natural ingredients and came up with a usable conditioner. I used it enthusiastically, and learned a harrowing lesson. The trouble is that, once damaged, curly hair can’t be restored (it’s still a hot mess and I will ultimately have to cut it in stages). However, I did really enjoy the residual effects that my concoction had on my skin as it rinsed out of my lifeless hair in the shower. So I retooled it, worked on creating a creamy texture, and lo and behold I had body butter. I instantly fell in love with my own product because it was made with my issues in mind and addressed all of my needs for moisturized, glowing skin. I hated sticky products and watery lotions. I also detested lotions and oils that soiled my clothes, and my concoction dried quickly on the skin without staining my garments. I wanted something that I could use on my face without it making me look like a walking oil slick. I also enjoy a simple product with only a handful of ingredients that are easily pronounced. I was lounging poolside in LA with a girlfriend. She needed moisturizer and I offered mine. She wanted to know the brand, and I confessed that I had made it myself. After asking several questions she enthusiastically told me that I should think about marketing and selling them. I laughed and sipped my refreshing Chardonnay spritzer. What a cute and funny idea. Then, as I began letting others try my product, they agreed. They say that it’s very emollient and works wonders on dry skin. And when the boyfriend became addicted to another product that I made — the body scrub — I gave it serious thought. Love him, but he’s one of the most particular people I know. So here we sit, nearly a year later. I’ve done endless market research. I’ve gotten deeper into the science of it — which has been SO much fun and rewarding. I’ve enjoyed picking out packaging and sourcing materials. I’ve turned my friends into my own personal guinea pigs and foisted samples upon unsuspecting strangers. I’ve created a list of future releases and I haven’t been this excited and anxious about anything in years. If ever. Who knew? Because Stacey is a dear friend, amazing writer and most importantly she was kind enough to sample the second-to-last iteration of the formula, I wanted to make sure to provide a giveaway for her esteemed readers. Two lucky readers will receive a full 4 oz jar of Kiss My Ash Body Balm, and an 8oz jar of Kiss My Ash Body Buff. If you don't win, feel free to visit my website at www.naturalsbyginab.com. Be sure to comment below by 11:59 PM on Sunday August 10, I'll announce winners on Monday. I have dry skin on my cheeks and would love to try these. I am going chemical free in my life and these sound perfect. Very cool! Thanks, Gina and Stacey! I have oily skin (face) and terribly bone straight fine and limp hair. I wish I could fix both forever! Thanks for the opportunity to try out your products! I have oily skin and lotion always makes me feel greasy. I'm always looking to try something new. The heels of my feet look like they belong on a troll. And that's being kind. I ped-egg them all the time, but anytime I'm in sandals, by the end of the day, my feet look like a Hobbit's, only not hairy. Or disproportionately large. Sounds awesome! Would love to win. How fabulous! Both my boys and I have dry, ashy skin and I'd love to give these a try! I have very dry flaky skin behind and inside my ears, I would LOVE to try these creams they sound amazing! I have really dry, frayed ends on my hair. I have mild psoriasis and the meds are awful because they're gooey creams and you can't get dressed, sit or lie down, or touch anything until it soaks into your skin. These sound great! My skin is mostly normal, but my forehead is crazy dry. Moisturizer is not enough, and I have yet to find the product. I have super dry and sensitive skin. So, I need something that will help both. I love, love, love Stacy's stories, and now I love Gina's (success) story as well! So inspirational, and very appealing to me, as someone who tries hard to maintain a clean eating/clean living lifestyle. And who doesn't love a good moisturizer? No one, that's who. You have the coolest friends. I have dry, sensitive, sometimes itchy skin. I would love to see what these products can do. I too have very curly/wavy hair - so I definitely feel your pain. I seem to have developed some slightly ashy dry skin lately - probably due to aging, but who knows!! Have tried a few different options, but have not found one I truly love. This sounds like it has exciting possibilities - and I love the story about how it was developed!! Sounds amazing, I've always had dry/scaly skin and moisturize constantly. I'd love to try these products! Kiss my ash...haha! Adore that. I waffle between dry skin and oily skin. Who does that?! I work in a medical office and wash my hands constantly, so my dry hands are my biggest issue! I yearn for the skin I had as a youth. At 40, my face decided that all the issues I had at puberty needed to come back. In force. I have skin that is dull and breaks out easily. I have tried many different treatments to fix, but nothing has worked yet. Wow, this stuff sounds amazing . I am 40+ and my skin is SO dry, for a variety of reasons not the least of which is too much sun in my youth. SPF, ladies! And moisturize. I have super dry hands, elbows and heels. I have tried everything I can find and nothing has every really had a long lasting effect. These sound awesome! I just moved to Arizona after 2 years in Florida, anything that could help my skin's moisture level would be very appreciated! A great moisturizer for the whole body! Winners Announced and A guest post with giveaway!